I am headed over to check in with my bargain priced listing in Upper Rainier Beach. Fresh flyers in hand, I will dry out the flyer box and replace the “forever” flyer in the front. I will sweep the floors, change light bulbs and make sure everything is in perfect showing condition. Then I will stop by the nearby Kubota Garden to walk with my dog, Sophia (see Cover Model in yesterday’s post below), before heading to the office for the day. Seriously this is a great listing and its time has come! This turn-key home leaves you guilt-free when adding your personal touches. Merely move in and decorate—or manifest your dreams with some hard-core remodeling. Fully fenced back yard for your 4-legged best friend(s). Lots of great gardening space. The yard is a blank canvas for whatever your heart desires. Built with pride in 1945. Step light on the Earth and live in a “recycled” home that has great green spaces! 2+ bedrooms, 1 full bath, 1090 sq ft fin, 1780 sq ft total. Partially finished basement, extra finished space. New gas furnace, cabinets, fresh paint. Refinished hardwood floors. 2 fireplaces. 2 garages – 1 attached, 1 detached. Corner level lot, approx. 6,000 sq ft, fully fenced back yard. The home is on bus route 7 and convenient to the new light rail station, downtown Seattle, Tukwila, Renton, several airports, etc. Views of Lake Washington in the neighborhood. 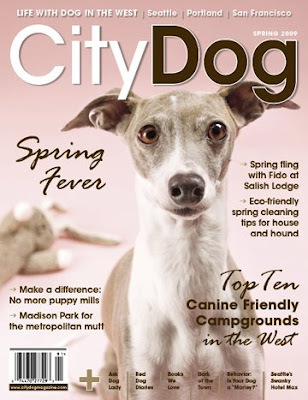 Presenting my Sophia as the Cover Model for the Spring issue of City Dog Magazine. We are charter subscribers and have crossed paths with the CityDog team on several occasions. We are proud to have been asked to be a part of this great West coast canine publication! CityDog comes back from the printers on April 7th, so you can look for it in stores (or your mailbox) shortly thereafter! I still have some posts to complete regarding GreenFest, but if you would like to see new social media technology in action, visit the Twitter feed on the Media page of GreenFestivals.org. I spent a lot of time Saturday in the “Live Blogging Zone” answering questions (some people thought we were an info booth) and showing people how to “#” a message so it would show up on the live feed at the show (and the internet). I have over 20 new followers since first tweeting on Saturday morning. My tweets feed to my Facebook profile so my friends there were also able to keep up with what was going on and make comments or ask questions over the weekend. This was the second event this month I attended on a “Media Pass”. Blogging is recognized more and more as a broad-reaching form of journalism. I call it “the people’s journalism”. It was a super weekend, I learned a lot, and met some new friends/followers! More later as I recap the rest of my #greenfest observations! Okay, someone beat me to writing this T3 list (Top Ten Tips). We recently spent over two months renegotiating our mortgage with Wells Fargo. My tips were simple: call early, call often, stay cool (which is why I assigned “renegotiating our mortgage” to my husband – he stays calmer longer than I), and don’t give up. Oh, and just to clarify we were current on our loan. So two weeks ago we received the news that our payments were to be reduced by half for 6 months, leaving a big balloon payment due in September. Success! Of course we had to agree to the terms without actually getting to read them – they figure since they have you over a barrel they’ll really do you while you’re there and you can’t squeak about it. The directive is that as long as we pay on time (by cashiers check or Western Union only, and due on the date of the negotiation, not the 1st of the month) after six months they will modify our loan. My assumption is that the massive balloon payment of over $11k that is not being paid during those six months will be refinanced into a new loan, terms yet to be negotiated. We’ll have an update in the fall as to how this all goes. We are pursuing clarification that payments to our escrow account will continue for the purpose of property taxes and our PMI payments will also continue uninterrupted. It’s quite possible that my lender is being paid $1,000/month – according to some of the terms of the Obama plan – to modify my loan. So they really aren’t “losing” too much money in all of this. This article reveals ten ways you can expedite and negotiate an affordable loan modification that enables you to catch up on any missed payments, lower your monthly mortgage payment, and keep your house. The Obama administration’s latest plans to bring relief to the financial markets have been dominating the news from Washington, but it’s far from clear whether they’ll actually produce more money for people to buy houses. What’s the greenest way to pick up after your pets? It doesn’t seem quite right to entomb dog waste in the landfill. However, a four-year Snohomish County study concluded that putting it in the garbage in a plastic bag is the preferred method. In the Seattle Times on Saturday Tom Watson had a great column that I actually got to hear a lot of in person at his joint session at GreenFest. I am still writing up my notes on what I learned, but I wanted to share his EcoConsumer column right away. I am convinced that man is a genius – or at least very good at parsing information out to the general public. Read What’s the greenest way to pick up after your pets? I am interested in green consumerism, so have selected a couple of sessions today to go to. At noon I stepped in to hear Bryan Welch "Seven Rules of Shopping for a Better World". He opened with that was a typo, and the sign outside said "shipping", the program said "shopping" and it was about neither. He doesn’t seem to have a title for this presentation, then, but said there were three mountains we needed to climb as a species and had some ideas as to how we were going to get over them. From the online program (which I didn’t look at until after the session): As publisher and editorial director, Welch leads Ogden Publications, a diversified magazine publishing and affinity marketing company focusing on sustainable and rural lifestyles. He leads Mother Earth News and Utne Reader and all of those other mags. He said our objectivity is what makes us human and pointed out what other species can look around and be aware of its own impact on its environment? How do we create a sustainable human future on this planet? Start with a vision of the kind of planet we want to live on, and then get excited. CONSERVATION – Conservation engages the human imagination. The imagination is the only fuel available to create a sustainable future. He said we have "destination fixation" – unlike a motorcycle rider who must focus on the exit of the curve with the tightening, humans are too focused on not crashing into the guard rail midway thru the curve, guaranteeing we are going to crash. I hope I got that analogy right because it was brilliant and my husband would have appreciated it, being a cycle and car nut. It is here where I thought wow, this is why I am here in this room. Some people got up and left. As a conscious thinking self-aware species we are given the capacity to create birth control. Desertification and deforestation, both of which hit records quantities last year and will do so again this year, are symptoms of overpopulation. "We are arrogant to think we can direct another population how to live," They are also entitled to live as comfortably as they can just like we are. |He pointed out the obvious: we don’t want to know about all of the horrible things going on in this world. When we are finally forced to face something like famine, what do we do? We send food. and this sustains them for awhile, long enough to grow the population. It is a continuous problematic cycle. (I don’t think he is suggesting we don’t send aid and let people starve, however). POPULATION – He said we are in reach of a sustainable future if we are able to engage millions of imaginations to tinker with the problem. He reminded us the the pedal bike, the automobile and the airplane were all invented inside of a couple of decades. Why? Because so many people got fired up about it and tinkered with it and kept making improvements on it. There were so many people working on the problem, it was improved quickly. No one follows a pessimist. The only rationale state of mind is positive enthusiasm. The first step is making a step towards human consensus on where we are today – the TRUTH, the honest picture. ECONOMICS – Unfortunately we have no tools to create prosperity without population growth. House values go up because there are always more and more people who need to live in them. If we are going to form consensus, everyone needs to have a stake in a positive future. This is the part we have trouble with. He talked about micro loans and how they have an incredibly low default rate. People are motivated by the common good on an emotional level. Next we need to create action from emotion. He believes economic justice (raising everyone up to above the poverty line) automatically lowers the birth rate (e.g. China). He doubts Americans will succumb to an authoritarion dictate to control how many children they give birth to however. I am really glad I ended up in this session accidentally. My husband and I made a conscious choice to not have children because of overpopulation issues. I appreciated the many thoughts Bryan Welch had along these lines and hope to be able to read more about positive ways we can take action to help overcome the three mountains he has identified as surmountable. Kevin Danaher, cofounder of Global Exchange said it best – we are visionaries seeking a solution, or "SOLUTIONARIES. What a great word. Both he and Alisa Gravitz, cofounder of Green America (formerly known as Co-Op America), made welcoming remarks to the 2nd Green Festival in Seattle. There were more hands raised when they asked if you were a new visitor than a returning – all the evidence I need to see that the green message has spread into mainstream culture. The Green Festival is a special event. Thousands of companies wanted to be here, but were not permitted since they do not meet the criteria of the cofounders Global Exchange and Green America. We were promised that every vendor or organization here meets the strict criteria of being a truly innovative/green company or product. Mayor Greg Nickels then made opening remarks. As he took the podium, some guy jumped up there and held open a sign/flyer and yelling "Biofuels, Crime against humanity" and some other gibberish. He actually got to stand up there and yell a lot longer than I expected – obviously they were not expecting protesters or activists. He was moved to the back of the room and he was able to continue to disrupt the proceedings for a few minutes while Nickels tried to speak over him. Nickels speech was almost the same as what I heard at the Built Green Conference in March 6th. He said that 935 mayors of American cities have pledged to meet the terms of the Kyoto protocol. "We are shifting from a culture of conspicuous consumption to one of careful conservation," he said. With the opening of the new light rail (supposed to be this year, but I have heard rumbles of delays", 70% of residences and 85% of regional jobs are reachable using mass transit. Nickels also announced the City of Seattle would be participating in Earth Hour, and from 8:30 to 9:30 PM the Space Needle would be turned off and also the City Light sign on 4th Avenue South and S. Spokane Street (viewable from the viaduct). I admit, I will be catching up on my DVRd shows by candle light. I am happy to turn my lights off, but I am way behind on "Dirty Jobs" and "Bonnie Hunt shows from this last week!! What’s great about getting to a big event like Green Festival early is that there are no lines keeping you from doing something you should. I skipped this last year but since the Undrivers License booth is right next to the Live Blogging Zone I had NO excuse to not do it first thing. Although I did not use a prop in my photo like most people do. Somehow a court jester hat just does not go with my jacket! Follow live tweets from the Green Festival. Someone just walked up and said “Hanging out in the Twitter Zone huh?”. Seems Twitter may be overtaking blogging as the term used to refer to quick online personal communications. Off to see some booths before the opening remarks at 11:30 AM! Tonight, March 28, 2009, at 8:30 pm, I am taking part in Earth Hour – a global event in which millions of people will turn out their lights to make a statement of concern about our planet and climate change. I want to invite you to join, too! Sponsored by World Wildlife Fund, Earth Hour got started just two years ago and is now the largest event of its kind in the world. Last year, more than 50 million participated and the lights went out at the Empire State Building, the Golden Gate Bridge, the Sydney Opera House and the Coliseum in Rome, just to name a few. Even Google’s homepage went black for the day! In Israel, President Shimon Peres personally turned off lights in Tel Aviv. This year, Earth Hour will be even bigger-already 2900 cities in 83 countries have agreed to take part including Seattle, Atlanta, Chicago, Dallas, Las Vegas, Los Angeles, Miami, Nashville, New York City, San Francisco and Washington DC, with more signing up every day. Around the world cities like Moscow, Hong Kong, Mumbai, Shanghai and Mexico City will turn out their lights. But Earth Hour isn’t just for big cities – anyone can participate. To get a better sense of the event, check out this video at http://www.youtube.com/watch?v=BjWD8pbK5t8. Participating in Earth Hour is easy, fun and free. I hope you will join me for this amazing event. To sign up, visit http://www.earthhourus.org/ where you’ll learn more including ways you can spread the word about Earth Hour, plus creative things to do when the lights go out in case you need inspiration! We want the US to turn out more lights than any other country in the world during this historic event so please pass this note along to anyone you think might want to take part. Let’s all turn out and take action on March 28 at 8:30 pm. If this means you watch TV by candlelight, that’s ok. You are still participating in Earth Hour!